This glass extension allows natural light and sunshine into the kitchen. 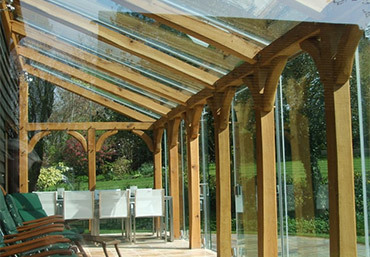 Single glazed sides are an option giving a very open ‘frame-free’ look. 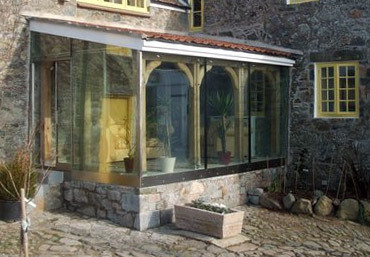 We specialise in light, open glass rooms using large scale glass, creating rooms where it seems there are no sides. From the inside, the internal frame helps with this illusion by concealing many of the joins in the glass. Though many of our rooms are of a 'lean-to' type construction, many styles are achievable and the basic idea of an internal frame covered in a 'glass box' is very adaptable. We also produce a range of glass basins and a glass bath in our glass studio. 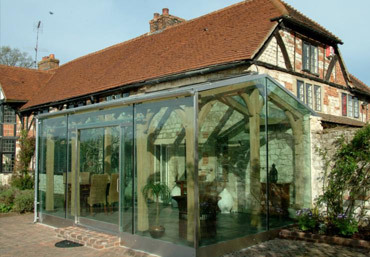 Do you have questions about glass rooms or planning permissions? Simply send us a message and we’ll be happy to help you however we can.